Nestled on the edge of the most colorful desert of the world (Rajasthan), Pushkar is a holy city held in high esteem by Hindus. It is situated 11 km away from the city of Ajmer, Rajasthan. It is one of the oldest cities of India. It is believed that it was created by Lord Brahma, the creator of the world. This holy city is also mentioned in the great Hindu Epic Ramayana which says that Vishvamitra (a saint) performed Yagna here. Every year thousands of devotees come to the city on Kartik Poornima (night of full moon) to take a dip in the sacred Pushkar Lake. It is believed that the water of this lake has the power to wash away all sins. The city is dotted with around 500 temples and ghats. The Pushkar city is famous around the world for its cattle fair called Pushkar Fair. 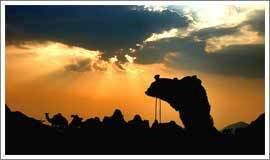 It is the largest camel fair of the world held in the month of November every year. The fair breaks the monotony in the lives of the people of Rajasthan as this is the time when people leave behind their daily routine to celebrate with fair with great enthusiasm. Apart from the trading of camel and other cattle, the fair is marked with camel races, Mr. Camel competition and brilliant dance and music performances by skilled artists. Pushkar also houses a temple dedicated to Lord Brahma, the creator of the Universe according to the Hindu Mythology. It is the only place in the world which houses a Brahma Temple. Visit Pushkar in the winters especially in November so that you can get an opportunity to see the world’s largest camel fair. The Jaipur Airport is the nearest airport located at a distance of 132 km from Pushkar. Flights from Delhi, Udaipur, Jodhpur, Mumbai and Kolkata are available. The nearest railway station is at Ajmer city which connects Pushkar with the major cities of India.